The mainstream media scam artists are at it again. The envirowackos'”sky is falling” narrative is growing ever more unpersuasive by the year, so they have to constantly push the meme that we are getting closer to Apocalypse. The most recent example is an article claiming that human beings emitted 9 billion tons of CO2 last year, as if that is cause for alarm. Let’s put aside the facts that carbon dioxide is a trace gas, and that it comprises just 390.31 parts per million of the atmosphere, (Oh my Gore, look at the huge letters! ), and that carbon dioxide is a little over 3% of the greenhouse effect, and that man contributes about 3% of that total (making man’s contribution about 1/357 of the greenhouse effect, no matter how you chop, dice it, or slice it). Then if we keep in mind the 9 billion figure, how big is the earth’s atmosphere? Why, it’s 5 quadrillion metric tons of matter! That may not seem like much to today’s Washington politicians, who are used to dealing in debt figures in the trillions, but it’s an awful lot bigger than a billion. How much bigger? In scientific computation, a billion is 109 and a quadrillion is 1015. I’ve seen various sources for the mass of the atmosphere ranging from around 5×10^18 to 5.3×10^18 kg, so the value of 5.27×10^10 kg seems to be right on. The key is that the percentage of CO2 in the atmosphere (383ppm or 0.0383%) is given as a percentage by volume. To determine the mass of CO2 in the atmosphere, you have to convert the percentage by volume to the percentage by mass. To do this, you need to look at the molecular mass of each of the gasses that make up the atmosphere. The main ones are Nitrogen (N2,) Oxygen (O2,) Argon (Ar,) and Carbon Dioxide (C02.) Take a look at the link to the molecular mass of air below, and you will see that if you multiply the percentage of each gas in air by the molecular mass of that gas, you will get the molecular mass of each gas in air. It also shows the total molecular mass of air to be 28.97kg/kmol. If we move the value of %CO2 they use to 0.000383 (383ppmv) we find the molecular mass of CO2 in air to be 0.017kg/kmol. To determine the percent by mass of CO2 in air we divide 0.017/28.97 and find that CO2 is 0.0587% of air by mass. If you multiply the total mass of earth’s atmosphere by the % mass of CO2 in the atmosphere we find, 5.27×10^18kg x 0.0587% = 3.09×10^15kg of CO2 are currently in the atmosphere (using 383ppmV.) [outdated figure, ed]. Therefore the kg of CO2 in 1ppm of the atmosphere would be 3.09×10^15/383 = 8.08×10^12 kg or approximately 8 Billion metric tons of CO2. Therefore, in 2010, man contributed a little over one parts per million carbon dioxide to the atmosphere, which is now 391 ppm. But does that mean we are on a straight crash course to disaster? Wait, the warming effect of carbon dioxide isn’t even linear, it’s logarithmic! What does that mean? That added carbon dioxide has a diminishing warming effect. 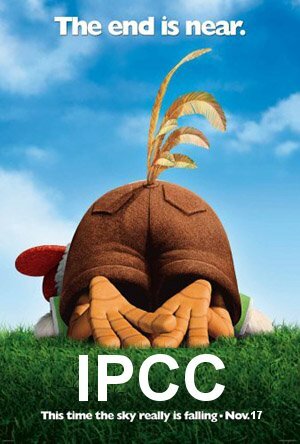 Don’t worry, Chicken Little. The global warming climate change alarmists are full of hot air once again. Helpful info. Fortunate me I found your site by accident, and I’m stunned why this accident did not happened in advance! I bookmarked it.